Hurricane Irene is expected to pass west of Martha’s Vineyard this weekend, but Islanders still should be prepared for a very strong storm with sustained winds of 80 to 90 miles an hour with higher gusts, heavy rain, a storm surge of as much as eight feet, and seas off the south shore of 25 to 35 feet by Sunday, weather forecasters warned. The warning was contained in a conference call briefing to a gathering of Vineyard emergency planners yesterday by Bob Thompson of the National Weather Service. He said projections showed Irene likely to hit somewhere between the Hudson Valley in the west and Cape Cod Canal in the east. But even if it takes the more westerly track, the wind field of the storm is so big it could send gales of up to hurricane force to the Island. At press time yesterday Irene was just north of the Bahamas, a category three hurricane with maximum sustained winds near 115 miles per hour. Some strengthening was expected overnight. A hurricane warning had been issued for the North Carolina coast, and a hurricane watch had been issued for the coasts of Maryland, Delaware, Virginia and New Jersey. The storm is expected to reach the North Carolina coast by Saturday morning, but forecasters are uncertain whether it will make landfall there or stay offshore. The hurricane is expected to reach the Northeast on Sunday — possibly New Jersey, Long Island or Connecticut, forecasters said. Irene is a large storm carrying heavy rains and high winds extending around it in every direction for many miles. Three days out this week, Vineyard officials, residents and visitors were taking the threat seriously. The first reverse 911 message warning Islanders to prepare began going out to households late Thursday. Emergency personnel formulated plans for possible evacuations and the opening of emergency shelters. Roads and harbors became noticeably emptier as boaters and tourists left. Summer and year-round residents scrambled to pull their boats from the water. The Steamship Authority began running extra trips on Wednesday in anticipation of ferry cancellations on the weekend. Hardware and grocery stores reported a booming trade in candles, batteries, radios, lamps and tarpaulins. Island towns now have access to so-called slosh maps, showing buildings which are vulnerable at various levels of flooding and storm surge. They will be able to target reverse 911 calls under the Island’s Code Red system specifically to those homes. Steamship Authority general manager Wayne Lamson said yesterday that the boat line had increased its capacity by more than 350 vehicles per day through the use of the freight ferry Governor, and the use of the lift decks on the Island Home. The Governor would account for about 250 of the extra cars, and the Island Home 112 per day, Mr. Lamson said. He said he anticipated ferry service to the two Islands would be suspended on Sunday due to heavy weather from the hurricane. The three freight boats, Governor, Sankaty and Katama are expected to be taken out of service on Saturday and moved to a safe harbor in Fairhaven before the New Bedford harbor hurricane barrier is closed. The Island Home and Martha’s Vineyard will tie up in Vineyard Haven when weather conditions preclude further trips. Philip Hale, owner of the Martha’s Vineyard Shipyard in Vineyard Haven, said he began pulling boats from the water on Wednesday. “We’re planning to haul 25 to 30 boats per day. We’ll continue until the weather changes, one way or the other. We’ll pull 80 or more by Saturday,” Mr. Hale said. 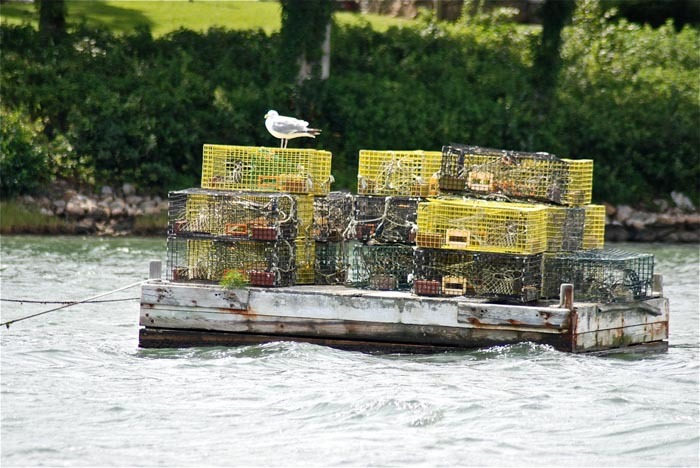 Other boats will take shelter in Vineyard ponds and coves. “We have a lot of small boats way up in Tashmoo, and there are others up in Menemsha Pond, Quitsa. In many ways, a lot are better off in nice, shallow, sheltered areas than they are out of the water,” Mr. Hale said. The biggest concern centers on larger boats whose owners are off-Island. Some will be pulled from the water, but in many cases, crews from Mr. Hale’s shipyard and others were engaged in taking down sails, masts and other gear to reduce their profile to the winds. “The biggest change in the past 10 years is that there are now so many more boats in exposed locations,” Mr. Hale said. How they fare will depend on how the hurricane tracks. “We’re planning for a pretty good blow as the storm passes through to our west side,” Mr. Hale said. 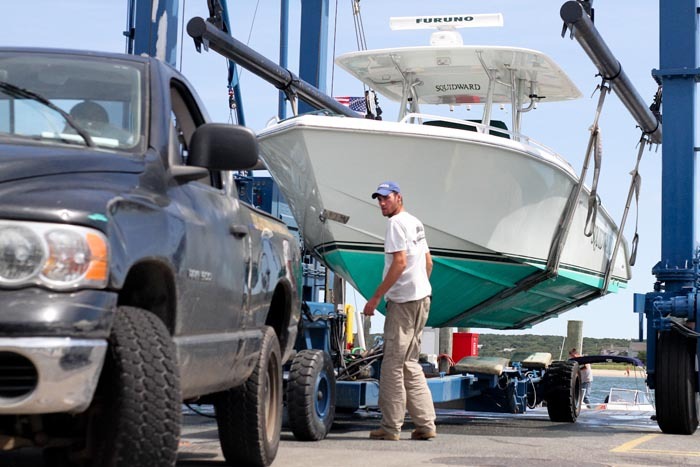 George Rogers, owner of Edgartown Marine, said his crews hauled 58 boats on Wednesday, another 45 as of early Thursday afternoon, and planned to haul another 125 over the next three days. 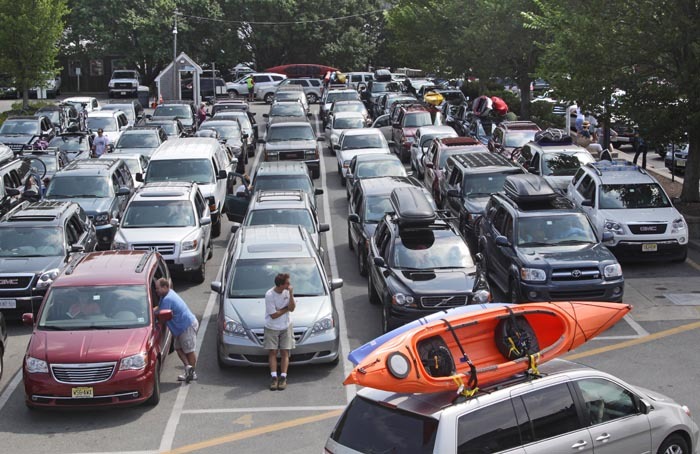 Drew Smith at the Menemsha harbor master’s office said the harbor had largely emptied out by Thursday morning. Many of the large fishing draggers had already left to weather the storm in New Bedford and Fairhaven behind the hurricane barrier. Oak Bluffs harbor master Todd Alexander said boat owners were being told to move their boats out of the slips and onto moorings, if not leave. People were warned that they were at their own risk on moorings. Edgartown harbor master Charlie Blair said his harbor was emptying fast yesterday. “I am kicking the boats out of the harbor as fast as I can. This is not a friendly harbor in a hurricane,” Mr. Blair said. Other predictions were not so dire. Dukes County Emergency management director Chuck Cotnoir said the models of the storm track he had seen suggested the storm would pass about 170 miles to the east of the Island. He expected tropical storm-force winds, 39 to 70 miles an hour, possibly with stronger gusts. In his briefing to the emergency services personnel on Thursday, Mr. Thompson, the meteorologist, said the main impact of the hurricane will likely be felt here on Sunday afternoon or evening. The leading edge, with tropical storm force winds, is expected to arrive Sunday morning, although the timing could vary by as much as eight hours. The heaviest rains are expected to fall to the west of the center of the storm, the strongest winds to its east. At press time predictions called for Irene to be a category one storm by the time it reaches this part of the coast, with maximum sustained winds of 95 miles per hour, or possibly category two, with winds up to 110 miles per hour. Residents are urged to be prepared. The potential for flooding will depend in part on how the storm coincides with tides. Dangerous rip currents are expected to be present in all the ocean waters around the Vineyard. Yesterday preparations were made to open emergency shelters in every Island town depending on the track of the hurricane. Additional emergency information, including about shelters, will be posted on the Gazette Web site (mvgazette.com) as it becomes available tomorrow and throughout the weekend. The Red Cross and Salvation Army are preparing to offer support if the storm strikes. NStar has crews on standby. Chilmark executive secretary Timothy Carroll said his town was prepping all departments yesterday to be ready for the storm. He said decisions about shelters, road closures and other emergency measures would be made by Friday night. “The National Weather Service is suggesting everything should be ready and everyone should be hunkered down, where they belong, on Saturday at 5 p.m.,” Mr. Carroll said. Gazette reporters Peter Brannen and Mark Alan Lovewell contributed to this report. This article begins by saying "Hurricane Irene is expected to pass west of Martha's Vineyard...." Later in the article "Chuck Cotnoir said the models of the storm track he had seen suggested the storm would pass about 170 miles to the east of the Island." Who should we believe?